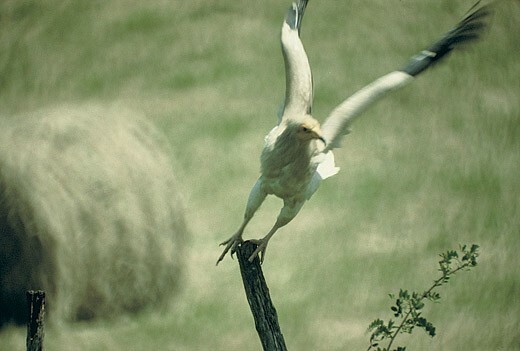 An Egyptian vulture, ringed in Ossau in 2007, was electrocuted on 12th May 2010 in the Sauvelade commune in the Pyrénées-Atlantiques department. While perching on power lines, the bird died of electrocution. 2009 was also marked by the deaths of 3 pairs from the Aude department that had a history of making homes in the area. In particular, mid-May saw the unexplained deaths of a brooding pair, followed by the death of another pair in another area (the parents died when the chick was only 60 days old – the chick was subsequently fed at the site by LPO Aude, until it was able to fly), and, at the end of July, the death of a young bird in its nest after the death of its parents at a third site. Investigations in the area revealed the carcasses of 4 griffon vultures, 1 Egyptian vulture, 1 black kite, 2 foxes and 1 cat not far from the site. Toxicology reports revealed carbofuran poisoning (the griffon vulture had 77 mg/kg of carbofuran in its gizzard; the Egyptian vulture had 108 mg/kg of carbofuran in its gizzard; the fox had 180 mg/kg of carbofuran in its stomach). An adult Egyptian vulture was found dead by Nature Midi-Pyrénées on 14th April 2011, beneath a power line in the Haute-Garonne department. The autopsy that was carried out confirmed that the bird had been electrocuted. This marks the second bird found in the Haute-Garonne department since 2004. This latest case brings the number of birds electrocuted in the Pyrenees since the National Action Plan for the species was implemented to three. After several years of negotiating with EDF and RTE, a working group known as the Comité National Avifaune (CAN) [the National Avifauna Committee] was formed. It includes EDF (Electricité de France), RTE (Réseau de Transport d’Electricité, France’s electricity transmission system operator), FNE (France Nature Environnement, including CORA) and the LPO. An agreement signed on 4th February 2004 ratified the creation of the CAN committee. This agreement formalises the commitment of the contracted parties to work together to reduce the impact of the electricity network on avifauna (cf. link to online bulletins). It sets out EDF and RTE’s motives for becoming part of the process, the role of the Comité National Avifaune, its area of investigation, topics that have been proposed and how the committee is run. The 5th February 2004, with the CNA, the LPO organized a conference in Valencia, attended by 80 participants, on the topic of ‘Avifauna and power lines’. This conference brought together individuals and groups from the south of France with links to the issue of birds’ electrocution (a network of EDF and RTE engineers and, alongside them, naturalists from FNE and the LPO). It represented a vital opportunity for everyone involved to meet for the first time and agree on how to ensure the safety of dangerous electrical facilities for the benefit of birds, particularly birds of prey. The CNA worked to draw up local action plans, specific to Egyptian vulture sites and the sites of other especially vulnerable species such as cinereous vultures, Bonelli’s eagles, etc. Generally, being exposed to a toxin can weaken a bird’s immune system and cause nerve disorders that lead to its death (cases of lead poisoning) even if the cause of death seems to be something else. In order to detect poisoning or whether an animal has been exposed to a toxin, a toxicological study is needed. In the Pyrenees and south-eastern France, the risk of poisoning is closely monitored. An initiative to monitor contamination and poisoning risks for scavenging birds of prey has been established. It relies on a network of bird watchers who report and collect the carcasses of red kites, bearded vultures, Egyptian vultures, griffon vultures and cinereous vultures, for example, in order to study the causes of their deaths and their contamination levels. Of the species listed, four are subject to specific National Action Plans because of their status in France and Europe: bearded vultures, Egyptian vultures, cinereous vultures and red kites. A committee of specialists (veterinarians, toxicologists and ornithologists) analyse the results obtained by the autopsies that are carried out and toxicology reports are systematically produced by specialist laboratories. In the medium term, this initiative should enable a map of cases and causes of death in southern France to be drawn up and should lead to a comprehensive understanding of the quality of the habitats of these birds of prey and their survival risks – as a result, they should enable specific protection measures to be identified.